With this feature it is possible to buy pre-paid coupons packages for any type of service, offered at a promotional price (for example: 10 dinners with standard price of 200 euros, at a discounted price of 150 euros). The payment is possible with Paypal & Cash, a new version will be released soon with more payment supported. This module is sold with a yearly subscription. 99€/yearly. You can install the module on two Siberian installation, one Production and one Beta testing. PayPal – to enable this type of payment you must first configure the parameters of the PayPal account to which you will receive payments. WARNING: the payment options “Bank Transfer” and “Stripe” are not available at the moment. They will be usable soon. It is recommended to keep the “Enterprise Payment” disabled: payments will still be available but in this way you will not have a superfluous item in the menu. Once the “Enterprise Payment” feature (appropriately configured as indicated in the previous paragraph) and the “Carnet Copupons” function are present in the app, we can proceed to insert the carnets that users can purchase. Simply click on icon at the “Carnets Management” section for the first entry. For the subsequent ones, click on the button in this section. From this section it is possible to check the carnet purchased by the customers and confirm the payments. If the user makes the online payment (PayPal, Stripe) the purchase status is automatically set as “Paid”. If payment is made in cash, the manager must confirm the payment, either from the app directly on the customer’s smartphone or in this section. Click on “Change to Paid” (green icon on Action column) to confirm payment. Vice versa, if the status is “Paid” you can change the status by click on “Change to Pending” (yellow icon on Action column). You can also assign the status “Void” to cancel in payment (red icon with X). From this status it will be possible to restore the “Paid” or “Pending” status. In order to use carnet coupons it is necessary that the manager (or an operator in charge) insert his pin from the client’s smartphone. In this section it is possible to define the operators involved in the validation and enter the corresponding passwords. NB: the PIN number of the employee will also be required to put the carnet in the “Paid” status in the event that this operation is carried out directly on the customer’s smartphone. 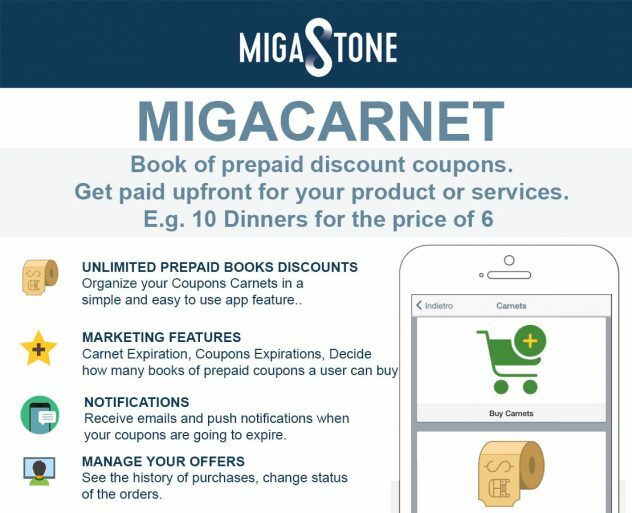 In this section you can enter Terms and Conditions and set the automatic messages sent by the Carnet Coupons feature. 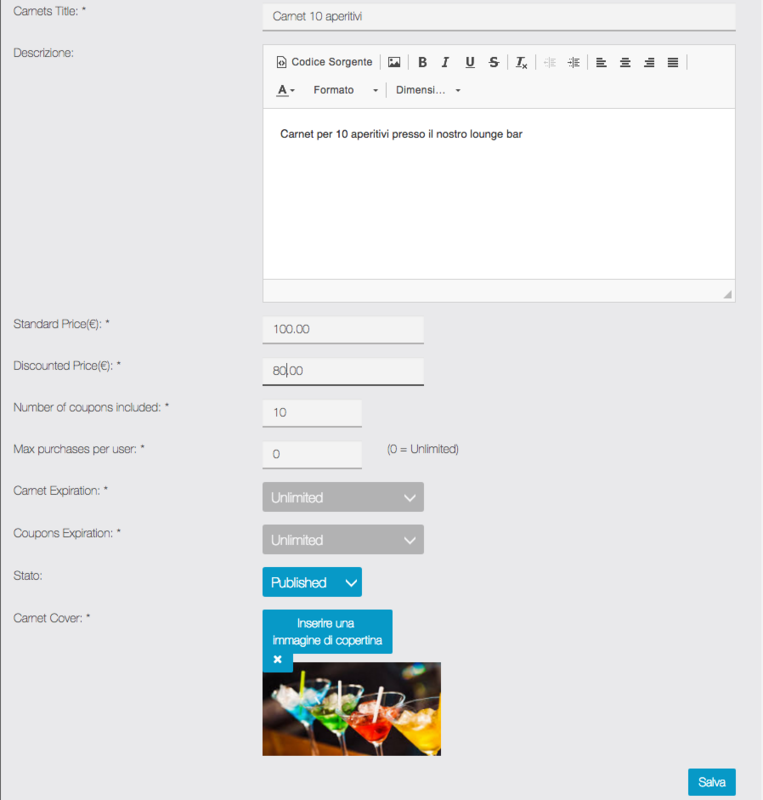 To customize the messages already set by default, select the type of message desired from the drop-down menu and edit the corresponding text field. Use the Tags available for the parameterized fields (Name, Surname, Title of the carnet, etc.). It is possible to enable the sending of the CC messages to your email address. Finally, customize the icons that illustrate the purchased, availables and pending parnets on the page of the app. 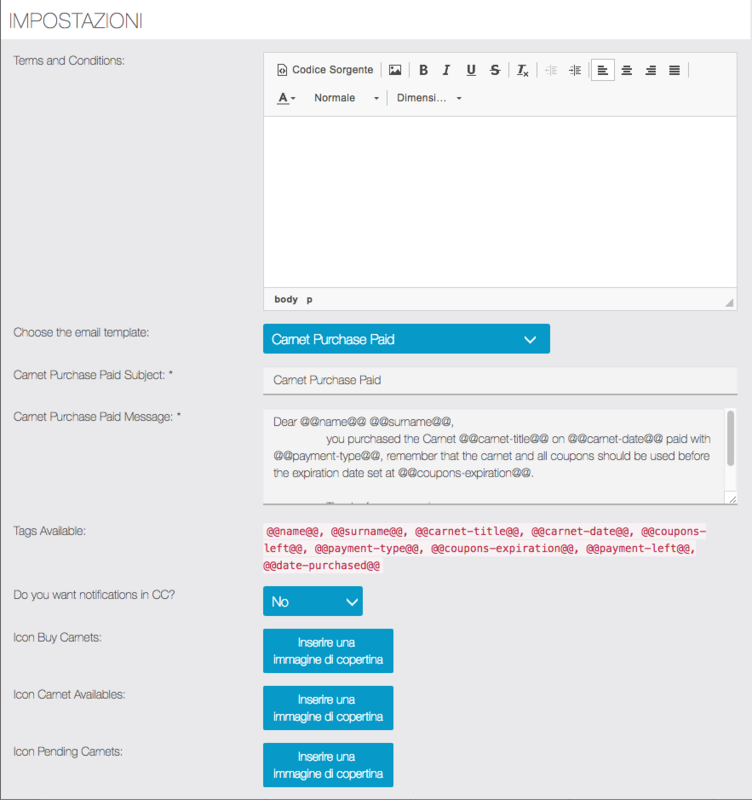 Carnet Available – shows the carnet purchased by the user. This page will show only the carnet that are paid. Pending Carnets – shows the carnet purchased by the user but whose payment is not yet confirmed. NB: if the user makes an online payment (PayPal, Stripe) that is successful, the carnet will automatically be in “Paid” status. If the user makes a cash payment or bank transfer, the manager of the app will change the status to “Paid” as explained in the previous paragraph.